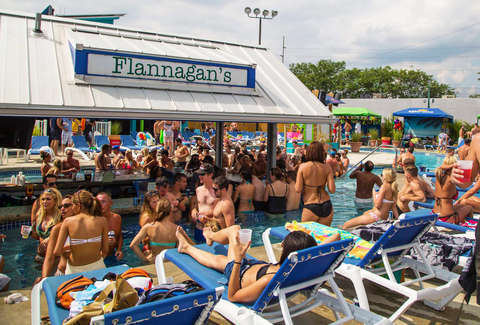 Believe it or not, swim-up bars aren't just something you find in Cancun or Turks & Caicos -- they actually exist right here in America. We've rounded up 15 of them, in places you'd expect (Hawaii, Vegas) and places you definitely wouldn't (New York, Wisconsin, Ohio, Iowa...). We'd say "pull up a stool" but that might be difficult since most of these stools are concrete and attached to pool bottoms, so instead we'll say wade over, plop down, and get ready for a long afternoon. Swimming up to the bar in a Times Square joint does not necessarily mean wading through the sea of sweaty, red-faced tourists you’d find at most establishments in the area. 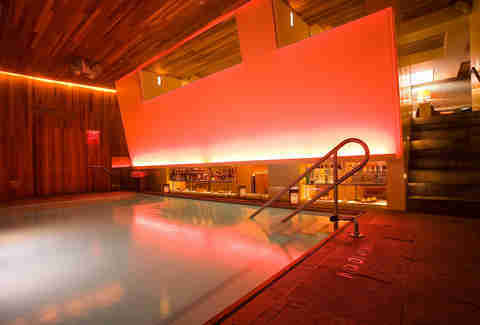 The Roommate Grace Hotel boasts an aquatic lounge with a small, shallow pool, under-lit with colored lights and flanked by a mezzanine area on one side and a swim-up bar on the other. The mezzanine is decked out with lounge sofas overlooking the pool, so you can watch bikini-clad women playing chicken the way a Roman emperor surveyed gladiators fighting in the Colosseum. Are you not entertained? 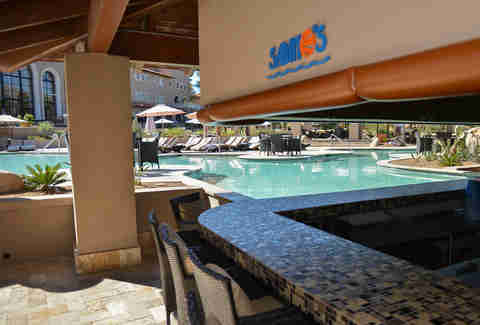 Pro-tip: Enjoy the twists and turns of the sick waterslide at The Westin in La Paloma BEFORE swimming up to order a Chile Burger and frozen margarita at Sabino’s Bar & Grill. Yup -- swim. Up. GRILL. One of the few food establishments where showing up with a shirt and shoes might actually be a problem, Sabino’s offers a variety of summer fare to choose from as you ponder their menu from atop their submerged bar stools. With a view of the Santa Catalina Mountains, you can’t go wrong with a lazy Sunday afternoon floating around, drink in hand. It’s Texas; there’s no reason to be standing around in the dry heat, blistering and parched, when you could be sipping on a strawberry mojito in the Hilton Anatole’s swim-up bar. Yeah, the beach might be RIGHT there, but does the beach have a caring bartender to cater to your every possible thirst? No. You can drink at their swim-up bar but if you want to get cozy with your pool-siren, there are a few tables sequestered in their own little nooks in the pool for some privacy. There may be plenty of adult-only pools, but not all of them are as tranquil as this one. There’s no danger of being hit in the face with a pool noodle or a fist-bumping college student. Overlooking the beach, the Palm Grove pool is surrounded by a wooden deck that includes a swim-up bar offering the resort’s signature shaved-ice cocktails. Complete with lounge chairs, mini Zen gardens, and cabanas, this is paradise’s ultimate chill spot. Aloha! If you’re here to play Marco Polo, you’re in the wrong pool. If you’re here to fist-bump with ladies wearing fluorescent snapbacks and throwing up deuces, you’re in the right place. 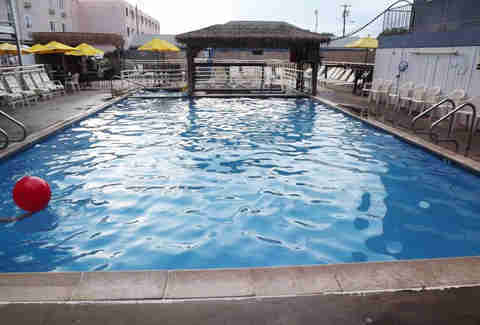 Non-hotel guests are allowed to frequent the Saturday Dive Day Club, an EDM extravaganza made even more appropriate by the swim-up bar in one of their three pools. Don’t feel like dancing? 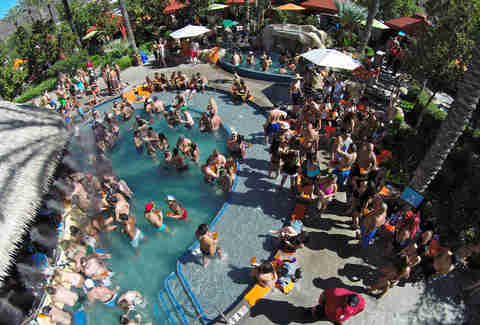 Grab a drink anyway and head down to the 400ft lazy river and let the bass from the main stage add a little bounce to your inner tube. 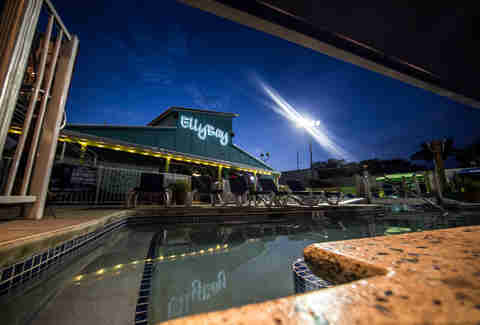 Despite being named after a sandy beach on the coast of Ireland, Elly Bay has been affectionately referred to as the “Cancun of the Midwest.” Trick yourself into thinking you’re on Spring Break with your buddies on a Tuesday by hitting the swim-up bar in the heated pool and then playing volleyball at one of their three nets. There’s a lot going on, what with it being a Spring Break-y annex to an Irish Sports bar -- but there’s a lot going on in a Long Island Iced Tea too, and those are delicious. Keep holdin it’ down, Jersey. The Oceanic “Hotel” isn’t the Four Seasons -- or even the Holiday Inn. 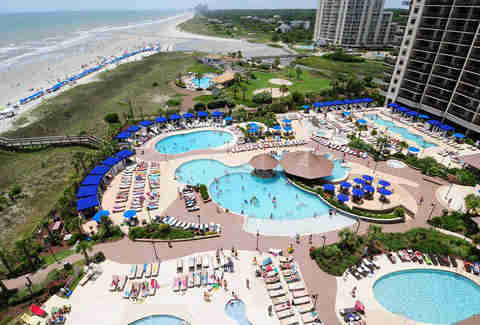 But if you’re looking for modest prices with an ocean view literally across the street from the boardwalk, seconds away from funnel cake and bumper cars, you’re in the right place. When you’re tired of little kids crashing into you with their boogie boards on the shore, you can take a dip in the pool, which includes a thatched roof swim-up tiki bar, jacuzzi, poolside grill, and indoor bar. As it's located right at the center of Adventureland Park’s lazy river, you’re more likely to float up to the Sand Bar than swim. With the tiki bar’s thatched roof and frozen cocktails, the folks at Adventureland have gone to great lengths to make sure patrons don’t feel like they’re in Iowa anymore. When all else fails, the instant escapism of the TV screens behind the bar will do the trick. Or a couple of Bermuda Blitzes. Wisconsin, you’re a wild card. 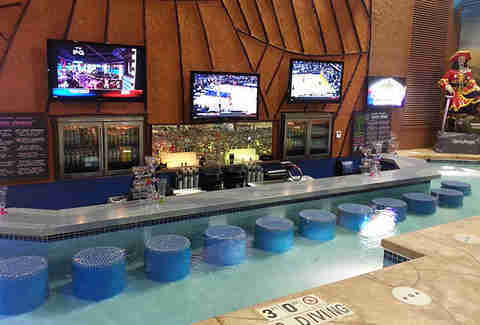 Nestled in this state known for its cheese is an indoor swim-up bar (surprisingly not its only one) at the Kalahari Waterpark. The whole indoor portion of the waterpark space looks like it could have been a level on Legends of The Hidden Temple so yeah, you’re going to run into some kids, but think of their swim-up bar as the over-21 oasis you need. 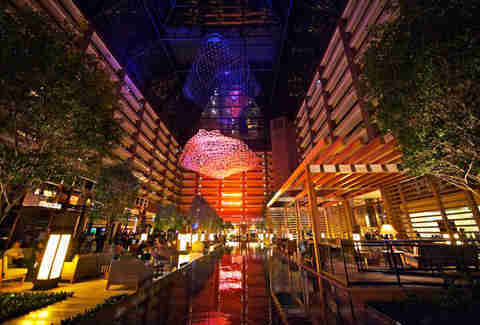 It says something about a hotel & casino when the pool is one of its sickest, most sought after attractions. Surrounded by palm trees, VIP cabanas, and lounge chairs, the pool spans 4.7 acres and includes drink service and the two-story Skybar, which features swim-up blackjack you can enjoy with drink in hand. Make sure to go on Sundays when their pool becomes the Rehab club in the afternoon, complete with the hottest guest and resident DJs. Tiered cake is cool and all but a tiered pool is a game-changer. And at the swim-up bar in the Lakeway Resort & Spa in Austin, what’s sweeter than a three-tiered pool with a swim-up bar as the topmost tier's crowning glory? 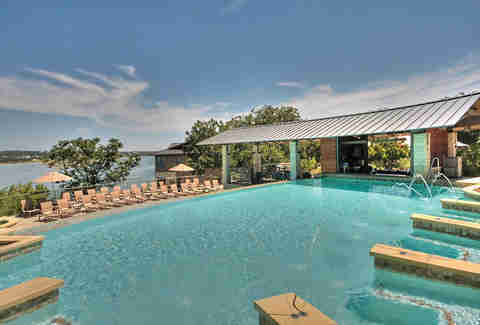 The entire pool overlooks Lake Travis and the bar itself has $8 cocktail specials on the weekends, serving up favorites like Coconut Mojitos and the Lakeway Limeade. 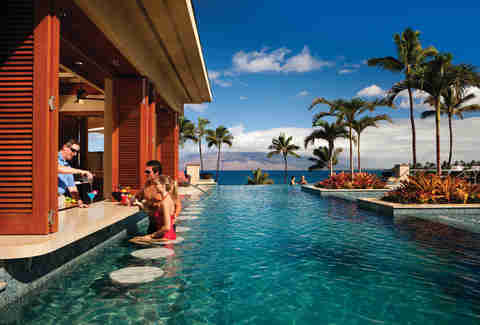 How different can one Four Season’s Hawaii swim-up bar be from the other? Much like all chocolate is delicious but not all chocolate tastes the same, the Maui hotel’s swim-up bar is just as impressive but has its own personal touches of flair. 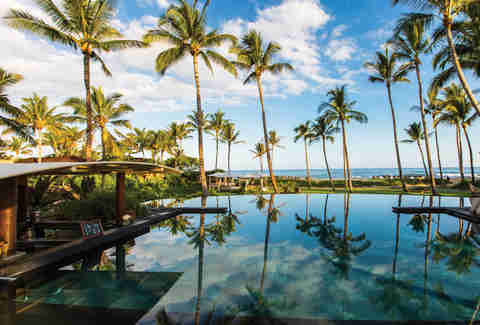 This peaceful adult-only pool has an infinity edge overlooking some pretty serious views of the West Maui mountain range and the island of Lanai on the horizon. Dive a little deeper into the pool and have the underwater music system serenade you as you swim towards the mosaic-topped swim-up bar for a specialty cocktail. Nothing’s perfect, but Hawaii comes pretty close. This is how Caesar would have wanted to party -- the togas were a formality. The Garden of The Gods Oasis at Caesar’s Palace is over-the-top ridiculously decadent with seven different pools, all vast expanses of marble and towering columns of white. 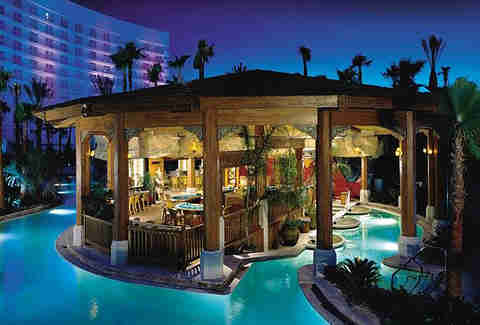 Technically there is no swim-up bar -- wait it gets better -- but there are swim-up blackjack tables at the Fortuna Pool. The pool itself has the adjacent bar Fortuna Bar and drinks are permitted at the blackjack tables so you can win cash while you splash. How does spending #SundayFunday posted up at a pool bar with a salty-rimmed marg while jamming out to a Bob Marley tribute band sound? 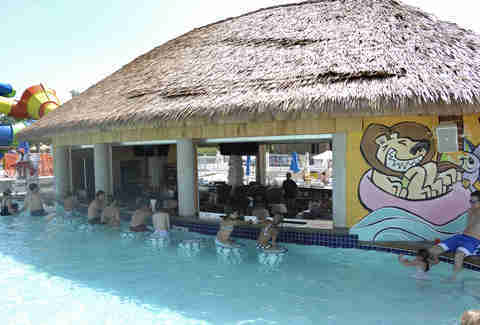 Margarita Sunday is every week at the swim-up bar at Harrah’s Ak-Chin, and for $10 cop a wristband worth two drinks -- wine, beer, or, good guess, a margarita. A live band serenades guests who may also order specialty cocktails and even bar food like sandwiches and chicken wings at the swim-up bar. You don’t have to wait an hour after you eat to get in the pool if you’re already in the pool. Logic.